Finally tried Santoka Ramen today at the Mitsuwa Marketplace in Costa Mesa. I ordered the #1, since I really had no clue in the difference between the other choices. The #1 ($6.49) turned out to be Shio (Salt) Ramen, a bowl of ramen in a milky broth (exactly what I was hoping for), topped with a slice of thick fatty pork (looked like pork belly), some finely diced scallions, julienned black wood ear mushrooms (I think), a few strands of bamboo shoots, and the requisite piece of fish cake with a pink spiral design. First the noodles. These were excellent and perfectly cooked. It was supple but still firm, with a nice texture and appealing bright color (not a pale white like I'm usually used to). Next the toppings. One word: awesome. The fatty slice of pork practically melts as soon as you bite into it. The fat enveloping your tongue like a warm sinful blanket. The bamboo shoots were still crunchy, but, this is important, not fibrous. The scallions and mushrooms added additional flavor, texture, and color. The fish cake? Well, it's just a fish cake. Nothing special there. Later on, I found a chunk of meaty pork hiding on the bottom of the bowl. A nice surprise. Now the star of the dish. The soup. It was as I imagined it should be. Now, granted, I am not a ramen expert. In fact, this is the first time I have ever tried a ramen with a rich, milky, murky broth like this. I know someone will remind me what this style is called. Whatever it may be, I am now a convert. The hot milky soup simply filled my mouth with so many complex flavors. It is sweet, porky, salty, savory, peppery and creamy, all at once. Creamy you ask? Yes. But not overwhelming so. If I shut my eyes, and clear my thoughts of what the soup actually looked like, my taste buds would still register the creaminess and the body of this soup. You truly get the essense of everything that went into the soup. I did not leave a single drop. Now, at $6.49 ($6.99 with tax), which was just about the cheapest item on the Santoka menu, I can understand why it wasn't the most crowded stall there. That distinction went to the Miyabi stall next door. There was an actual line going up the Miyabi window while Santoka was practically deserted. Santoka definitely sells a pretty expensive bowl of noodles when compared to what the other stalls were offering. But for today, and for my money, I felt it was worth it. the pork is actually cheek meat. very yummi i like ^_^. i had it in japan, and then tried it around where i live. I bet the Santoka in Japan uses an even fattier breed of pork. It's great ain't it? I like SSG and Santoka equally, but like you said, for different reasons. For for no fuss, no muss bowl of soup, I usually just go to that food court. No tip required either! 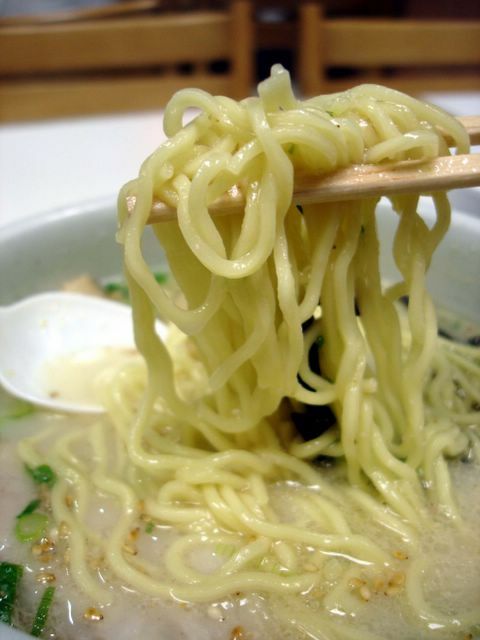 You can get the shio ramen with the super-fatty pork. I think the range is #13-16. The pork fat melts into your broth and makes it even more rich and delicious. do you know if there are vegetarian options? or in general do ramen houses always have a pork/some other kind of meat stock? Hmm...that's a tall order. I don't think there are many veggie ramens out there. 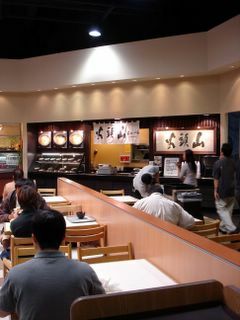 Most stock is made from pork, and if it isn't it usually is chicken or fish (bonito). There are miso ramen bases, but I think they have fish in the stock too. If I find out there's a veggie ramen out there, I'll let you know. You should however try Au Lac in Westminster. Great grubbin'! All vegan! Based upon your review and a recommendation from a few friends I tried out the Shio Ramen. It's definitely up there as the best bowl of noodles I've had. My only problem is, you get VERY thirsty after your done! i had lunch there today with my husband and all i can say is... heaven, i loved every drop of the soup! thank you for your recommendation. anywhere else in lake forest area that is comparable? The quality of Santoka's ramen is way above any of the other places in the food court. Its more expensive, but you're paying for sit down quality ramen. This is the best ramen I have ever had. I usually get the Miso Ramen. The noodles are wicked good and the broth outstanding. 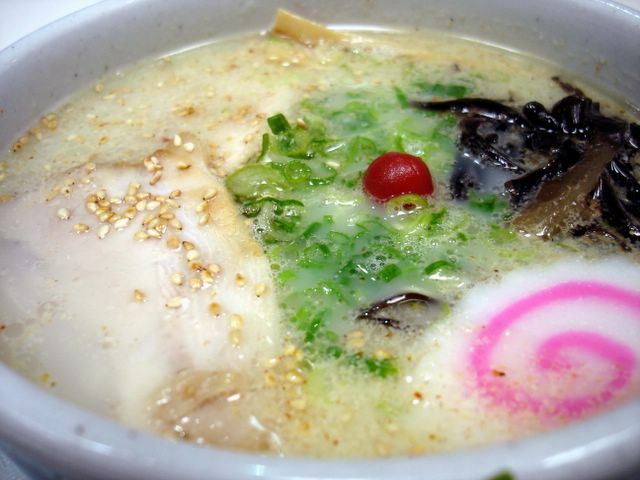 The broth is tonkotsu made from pork bones giving it that rich milky taste and look. The pork is regular chashu from the although it's very similar to the prized kurobuta (black pig). The fishcake (kamaboko) is referred to as "Naruto" which is inspiration for the Japanese anime character who shares the name. It basically means swirl. Anyway, bring cash because it's all they take. They open at 11 AM. Rats now I'm craving it!!! I ate there today with my son and his girlfriend and we all enjoyed it. Thee wee lines at both Santoka and the booth next door, I don't think their prices were much of a deterant and I thought their food was great and of good quality. I'll be back. I enjoy several different varieties of ramen at Santoka Ramen, in the Mitsuwa Marketplace in Edgewater, New Jersey. While enjoying some of the best ramen I have ever had, I can look out the window at the Hudson River and NYC and see the George Washington Bridge. The shio ramen is my favorite, as well, and I particularly enjoy their set lunch (large size, of course!) with chashu gohan and the hard cooked egg cured in soy sauce.